A tipster just sent us photos of the Nokia 700, a.k.a. Zeta, along with some specs though they didn’t confirm if there really is a 1GHz processor inside. In one of the photos you can see the new homescreen of Symbian Belle, the successor of Anna. They did give us some specs though - a 3.2" nHD AMOLED screen, which points to this being a Nokia C6-01 replacement. The Nokia 700 is also reportedly quite light (a bit over 80g) and measures 110 x 51 x 10mm, which doesn’t quite mesh with the "thinnest smartphone ever" claim, but those measurements can change as its design is still being developed. From the photo, you can see that the camera is a 5MP unit and has a LED flash. We can't guess at whether or not it has autofocus though. Also, the Nokia 700 has NFC connectivity, which Nokia seems to be warming up to following the Nokia N9 announcement. Other specs that the tipster managed to get out of the Nokia 700 (which as we speculated might be called N7) is that it runs Symbian Belle (an update to Anna) and packs Wi-Fi b/g/n. There's also fast HSPA speeds (10.2Mbps or 14.4Mbps downlink and 5.76Mbps uplink). The battery was a 1080mAh unit. That's all we've got for now. 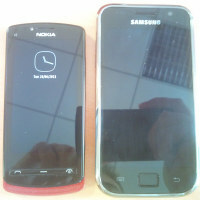 We're not quite sure what the differences between the Nokia 700 and the N5 are yet or the other devices from the leaked specs sheets.